It seems so long ago now but last week saw some of the heaviest snow Plymouth has seen for a good few years. The fact that the city itself got away pretty lightly compared with other areas didn't mean it was easy for anyone. 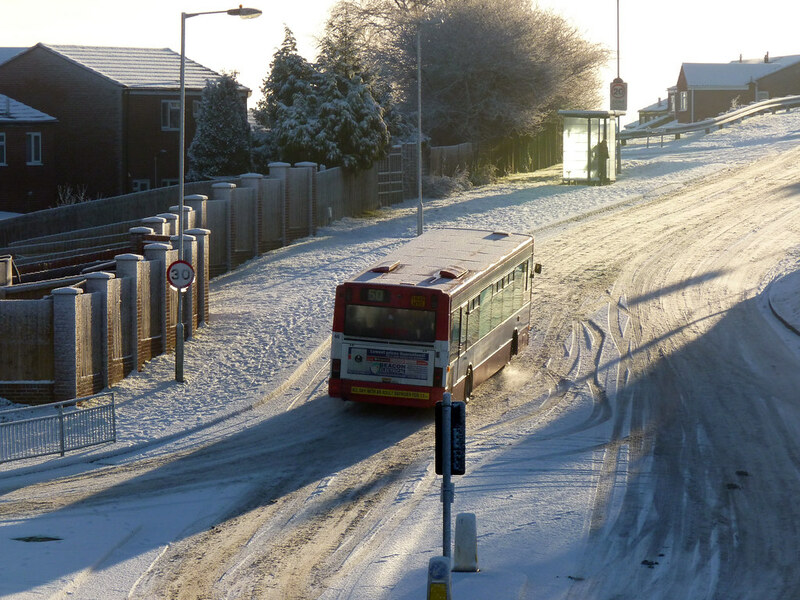 I have already had a picture post of the Plymouth Citybus 50’s in the snow but this is the start of a bigger look back to see how operators managed each day, mainly through their activity on Twitter which provided a crucial service throughout the period. 11:40 Service 21/21A will not serve St Maurice. Things soon settled down a bit and buses started to go back to some of the areas affected. 14:02 UPDATE TO PLYMSTOCK AREA: The service 5/5A is operating as normal with the exception of Holmwood Avenue. We cannot serve Holmwood avenue. 14:17 UPDATE TO PLYMSTOCK AREA: Holmwood Avenue is now open. The service 5 is operating as normal. 14:30 UPDATE TO SERVICE 50/50A - Keswick Crescent is now open. 15:12 UPDATE TO SERVICE 5/5A: Oaklands Green in Saltash is now open. 15:37 SERVICE 70/70A/70B UPDATE: Goad Avenue (Torpoint) is now open. 16:32 SERVICE 28/A UPDATE: Austin Crescent has now reopened. Obviously we can’t predict the weather (!) but we are expecting similar conditions tomorrow and will be working to keep disruption to a minimum. Judging by today’s disruption, we have outlined the services we expect may be affected tomorrow(1st March). If you are planning to catch one of our services from the following areas tomorrow (1st March), please be advised that we anticipate it will be highly likely these areas and stops will be experiencing service disruption. We would advise you to walk (taking care) to the nearest next stop along the route. We have managed to maintain a service along most main roads today and will endeavour to do the same tomorrow. This is what we anticipate will be affected tomorrow. Please check our social media pages throughout the day for the latest updates as they happen. Our team will be manning our Twitter and Facebook pages from early in the morning to try and help answer any questions you may have. Please bear with us as we work our way through any enquiries. RAME PENINSULA: Rame services beyond HMS Raleigh were suspended today (28th February). SERVICE 46A/46B: DHS Boys and DHS Girls. This service will not run. SERVICE 101 and 102: Southway and Tamerton Foliot. This service will not run. Callywith College will be closed tomorrow. Wadebridge School will be closed tomorrow. Looe School will be closed tomorrow. Our local Looe service will operate as normal. 05:55 Good Morning, All services this morning are currently running to schedule, however as the morning progresses the adverse weather predicted may well see this change. We will keep you all updated as and when the need arises. Stay safe. 09:45 SERVICE UPDATE 75: This service will not be serving Seaton or Downderry all day today. 10:31 SERVICE 11 UPDATE: This service will no longer be serving Trago Mills due to road conditions. 13:32 SERVICE 79 UPDATE: The weather has worsened in Cornwall. As a result this service will not serve Harrowbarrow. We are monitoring other Cornwall routes including Looe. Please keep an eye out for further updates and only travel if necessary. 13:42 SERVICE 33 will not serve Station Road or Warleigh Avenue due to adverse weather conditions. 14:44 SERVICE 5/5A: will not serve Plymstock due to adverse weather. Services will run up the main road as far as Elburton Roundabout. 14:45 SERVICE 76: this service has been suspended due to adverse weather conditions. 14:51 SERVICE UPDATE 12B: this service will not run between Launceston and Bude due to adverse weather conditions. 14:52 SERVICE 12: This service will not run between Callington and Launceston due to adverse weather conditions. 15:04 SERVICE 74: this service has been suspended due to adverse weather conditions. 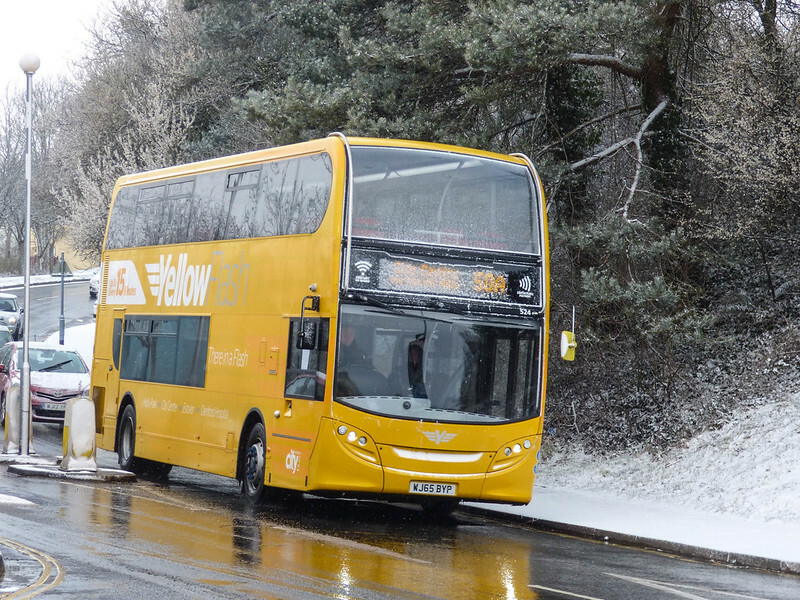 15:09 SERVICE 21/21A UPDATE: this service will not be serving Mudge Way due to adverse weather conditions. 15:25 SERVICE 15 UPDATE: this service has been suspended due to adverse weather conditions. 15:49 SERVICE 42C UPDATE: this service will not be serving Woolwell at all due to adverse weather conditions. 16:42 SERVICE 40/41/42A UPDATE: this service will terminate at the George Park & Ride. SERVICE 42C UPDATE: this service will terminate at the roundabout on the main road before Tesco. 16:44 SERVICE 44 UPDATE: this service will not serve Whitleigh Green. We will still serve Taunton Avenue. 16:47 SERVICE 11 UPDATE: this service will be delayed as the roads between Trerulefoot and Liskeard and Liskeard to Callington have been closed. More updates as we have them. 16:47 SERVICE 16 UPDATE: this service will now terminate at Lower Ham. 17:04 SERVICE 61/62 UPDATE: this service will operate via Little Dock Lane and will not serve Coombe Park Lane or Honicknowle Lane. 17:27 SERVICE 43 UPDATE: will not serve Ernsettle. This service will terminate at the top of Biggin Hill. 17:29 SERVICES 35/35A and 61/62: these services will terminate at the Cherry Tree (so will run City Centre - Cherry Tree and back) on main roads only. 17:29 SERVICE 44 UPDATE: this service will not serve Whitleigh Green or Taunton Avenue. This will be a main road service only. 17:52 SERVICE 12 UPDATE: this service has been suspended. 18:11 we will now only be running the following services. Serv 5 to Elburton Roundabout. Serv 21 St Budeaux - Lord Louis. Serv 42 to Derriford. The serv 43 to St Budeaux. 70B to Torpoint. All other services are suspended. We apologise for all inconveniences caused. 18:40 Last services will run from Royal Parade on our adverse weather network at 11pm. Service 5/5a/21/21a/34/42/43/70B are the nly routes running some are part routes due to road closers etc. Sorry for any inconvenience. 20:31 Due to weather advice we have taken the decision to run our last services from Royal Parade tonight at 10pm not 11pm the last services will run to their end point and return to depot after 10pm. Sorry for any inconvenience. .....Service 42 City to Derriford, 43 City to St Budeaux and 70 Torpoint to City centre via union street not serving Goad Ave. All other services are not likely to run before 8.30am at the earliest this will be reviewed on an ongoing basis in the morning. Sorry for inconvenience. 07:05 SERVICE 8 & 9 these services will continue to not serve Efford. They will go as far as Laira Green roundabout where they will turn and go back. 07:21 SERVICE 16: this service will now terminate at Lower Ham. 07:46 The service 8 & 9 are operating direct via Laira Narrows to Laira roundabout only. 08:11 Update: Southway and Whitleigh services returning to normal route. 08:24 SERVICE 44 UPDATE: this service is now running its normal route. 08:52 SERVICE 16 UPDATE: this service is now back to its normal route. 09:05 SERVICE 43 UPDATE: this is now running a normal service. 09:15 SERVICE 12 UPDATE: this service is now operating as far as Launceston but will not be serving Stoke Climsland. 09:25 SERVICE 33 UPDATE: the diversion on this service has changed. We will now be able to serve St Levans Road INBOUND. 09:34 SERVICE 21/A UPDATE: we will now be able to serve Mudge Way, Glen Road, Langage Roundabout and back. 09:46 SERVICE 11 UPDATE: we are running a normal service on this route. Please expect some delays as we navigate the roads. 10:26 SERVICE 12B: we are now running a full service, but will not be serving Stoke Climsland. First service on this route is the 10AM departure from Royal Parade, which is running on time. 10:40 SERVICE 42A/B UPDATE: this service will now serve Tamerton Foliot. 10:53 SERVICE 5/5A UPDATE: this service is now running the full route in Plymstock but will not serve Holmwood Avenue. 14:21 SERVICE 21/21A UPDATE: We are now serving Wolverwood Lane. This may change as it becomes dark due to a fallen tree. Please check for updates. Saturday 3 March and its all just about over! This post is just to show how hard Plymouth Citybus worked to keep services running and more importantly how hard they tried to keep passengers informed. On the whole passengers accepted it and were grateful for the updates and there were plenty of messages of thanks for the drivers and messages for them to keep safe. December 2010 We don't often get snow in Plymouth, and we certainly haven't had the volume of snow that many places have. Being a Saturday meant for once I had a chance to get out with the camera to see how the buses were getting on. this is brilliant, hats off to them for working so hard to run a service and also giving such good information. well done citybus.